Looking for a creative way to give Easter treats? 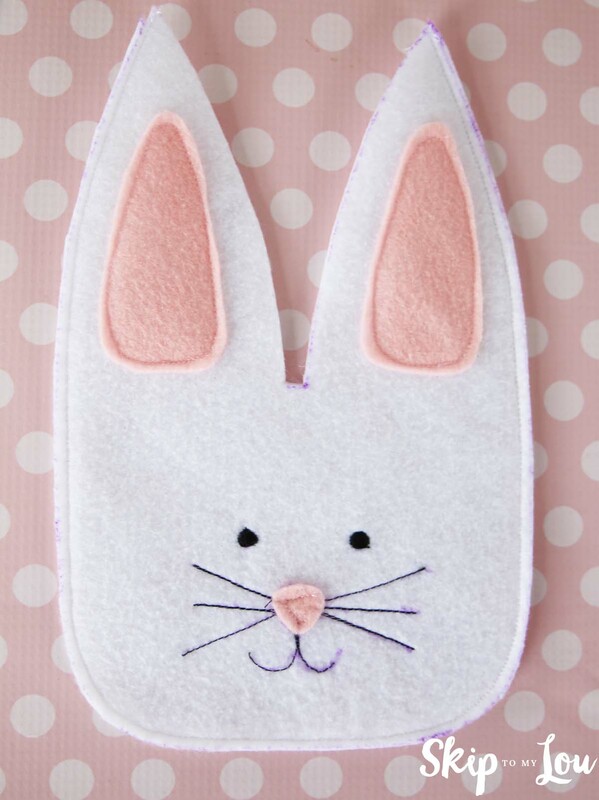 This felt bunny treat bag would make the perfect little favor for Easter dinner or as a take-home party favor. It would also be cute tucked into an Easter Basket. 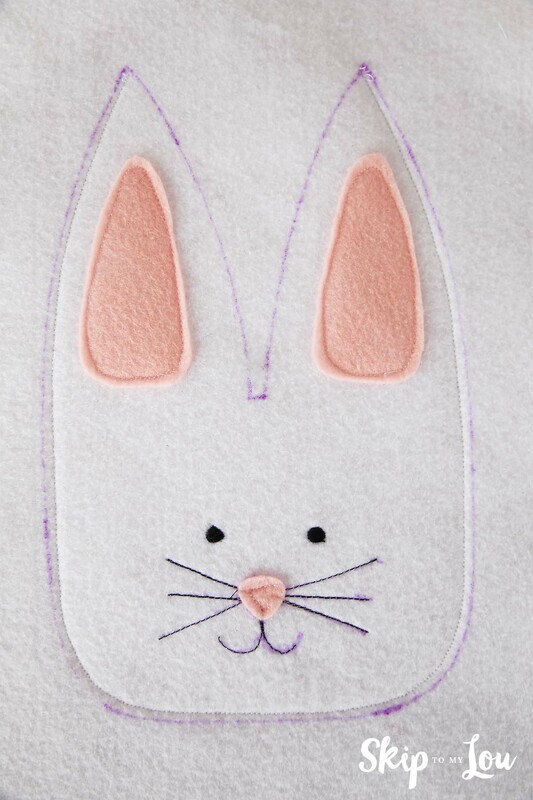 Our free pattern makes this such a fun and easy Easter sewing project. These felt carrots pencil holders are another great Easter sewing craft. The carrots and bunnies are both easy sewing projects that go together quickly! If you want to keep the kids busy and entertained on Easter, be sure to print out a few of our Easter Coloring Pages. I also have loads of great ideas and tips for dying Easter eggs with food coloring. 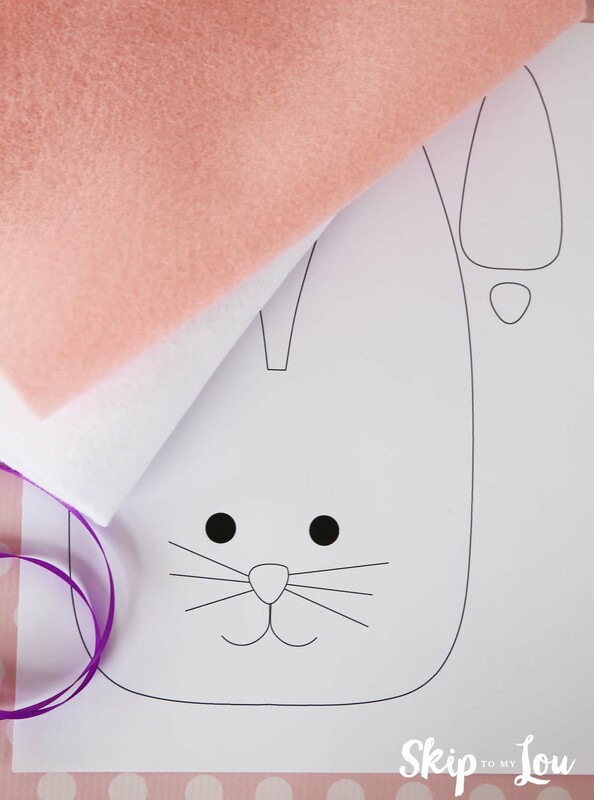 First, download the our free bunny treat bag template. Cut it out, then trace around it onto the white felt. Add the facial details as a sewing pattern guide, or free draw your own cute face. Next, trace around the inner ear and nose template onto the pink felt and cut them out. With the sewing machine, add the facial details. For the eyes I used stitch 46 on my Babylock Rachel. You might have something similar, but feel free to experiment if you have different settings on your sewing machine! This is a great time to use those fancy stitches. The facial stitches could also be hand-sewn, or simply drawn on with a fabric marker. Next, sew on the pink nose and ears. 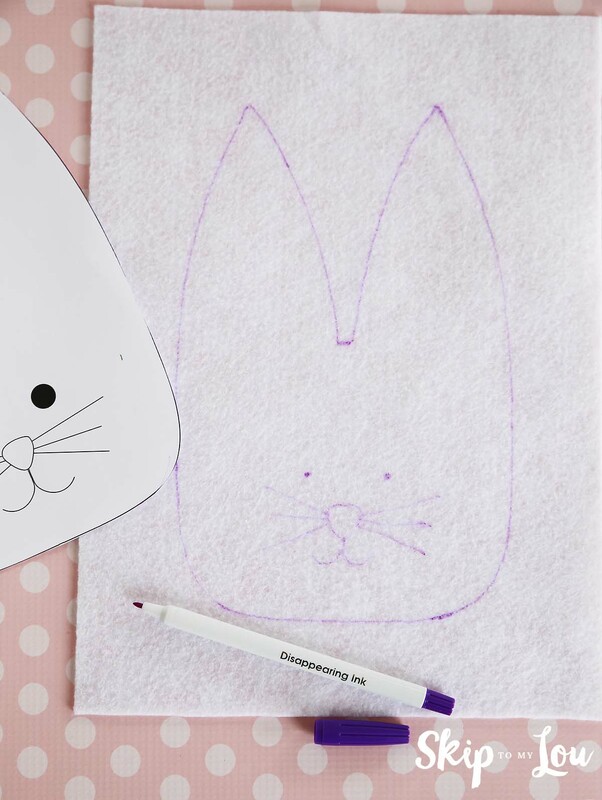 Now you’re ready to stitch the outline of your bunny’s head to make the bag. Put the second piece of white felt behind the bunny, so you are stitching two pieces together. Stitch, starting from the tip of one ear, all the way around to the tip of the other ear. Do not sew the inside part of each ear – that forms the opening of your bunny treat bag. 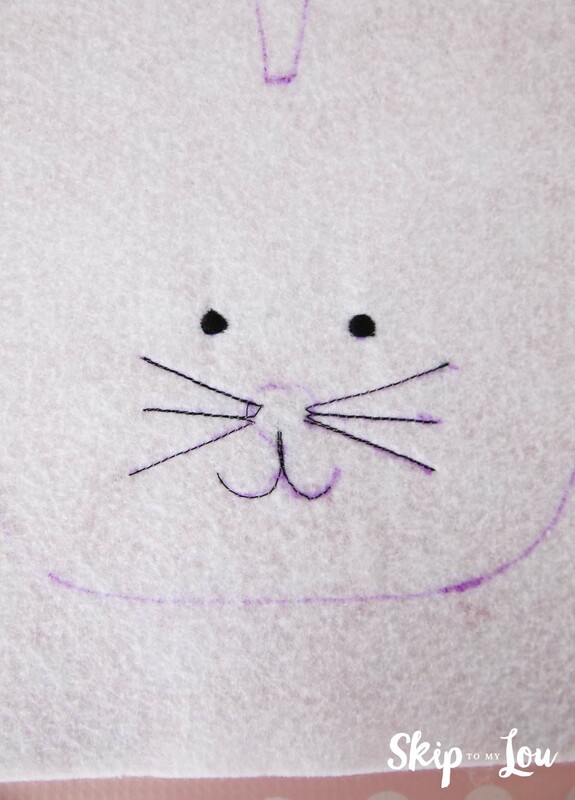 Now you can cut around your bunny close to stitching, being careful to not cut into the stitching line. Lastly, cut out the inside of the ears on the marking line. Now you’re ready to fill your bunny bag with treats and fasten the ears together with a ribbon. This is a great way to use little odds and ends of pretty ribbons and they look so inviting set out as Easter dinner place settings at the kids’ table. All done! 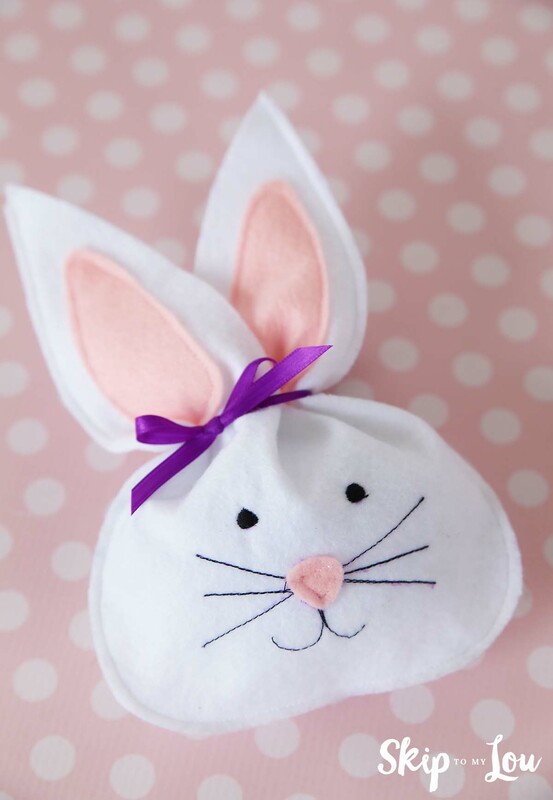 How easy is that for a little Easter sewing craft? These are so simple that once you get the hang of it, you can whip them out in no time to have one for each of your guests. They are kid-pleasers for sure – I mean, who could resist that cute little face? 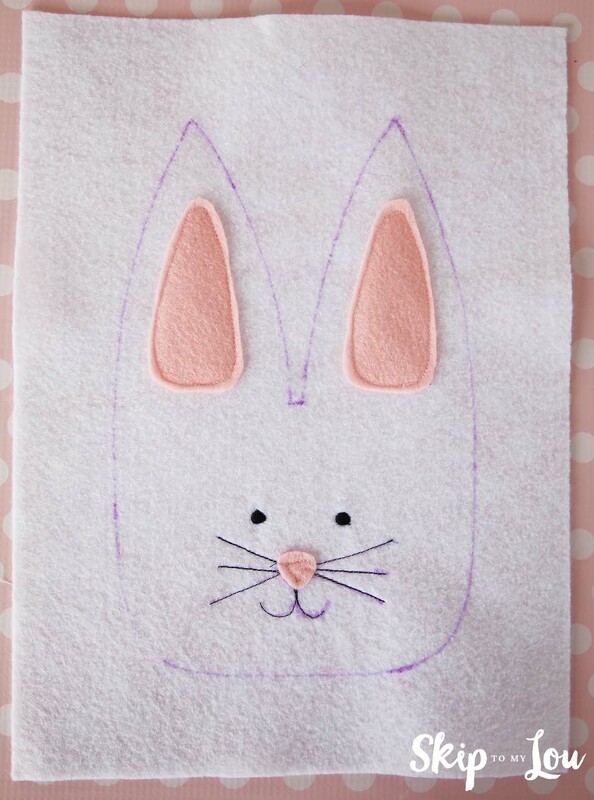 If you’re looking for other Easter sewing craft ideas, have even more fun with this cute bunny puppet! 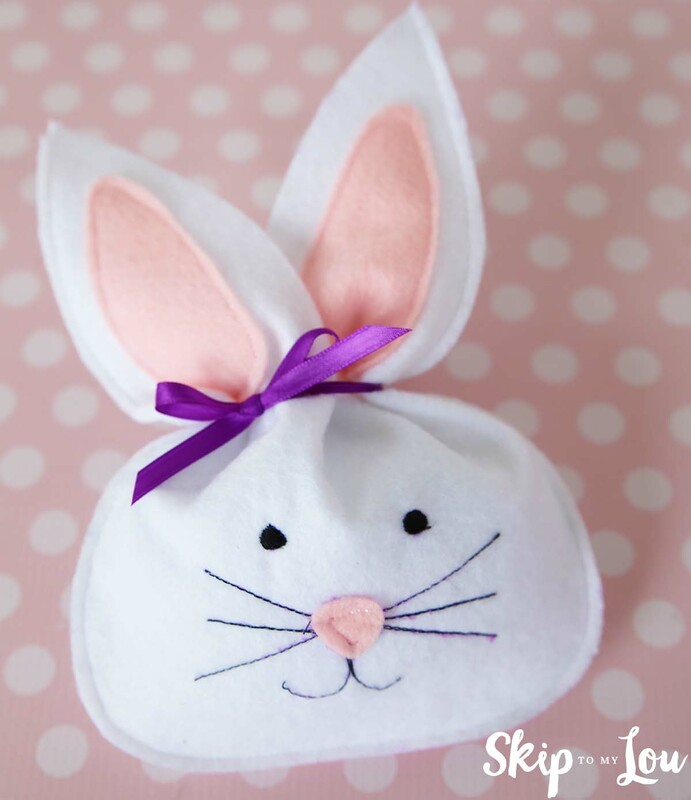 This free pattern can be made with the same materials as our felt bunny treat bag. The kids will have a blast making these hand puppets and putting on a puppet show at your Easter get-together.